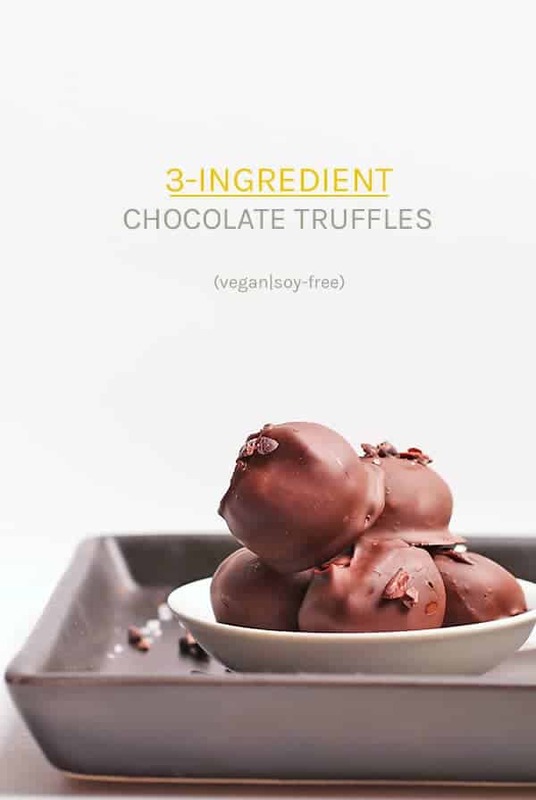 Make your Christmas chocolates at home with this simple 3-ingredient Vegan Chocolate Truffle recipe. A rich and decadent chocolate ganache base covered in a crisp chocolate coating, these truffles make the perfect DIY holiday gift. We are knee-deep in Christmas baking now. This month started off with a remake of one of YOUR favorite cookies from my archives, these Red Velvet Crinkle Cookies. We then chowed down on some Eggnog Cheesecake Thumbprint Cookies. Now, with our bellies and freezers full, I bring you another one of my favorite Christmas sweet treats. 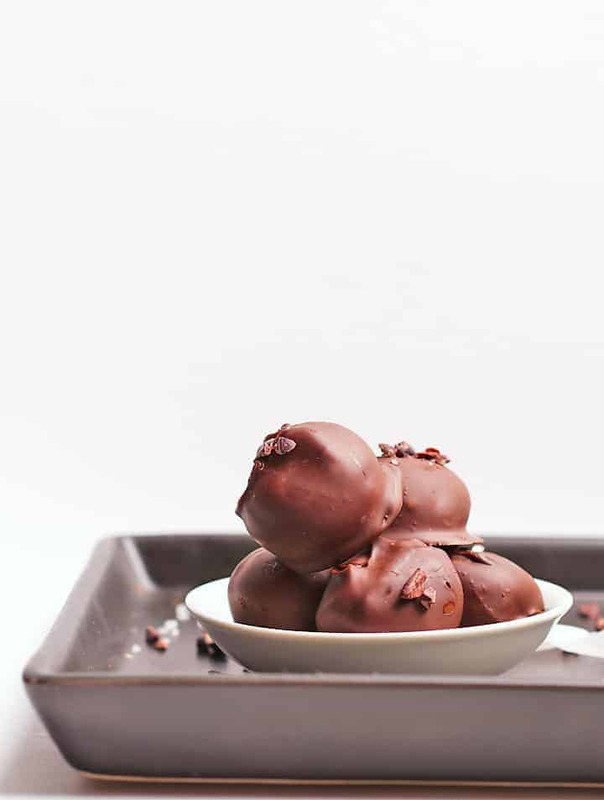 Another recipe from the archives of this old blog, these 3-Ingredient Vegan Chocolate Truffles. 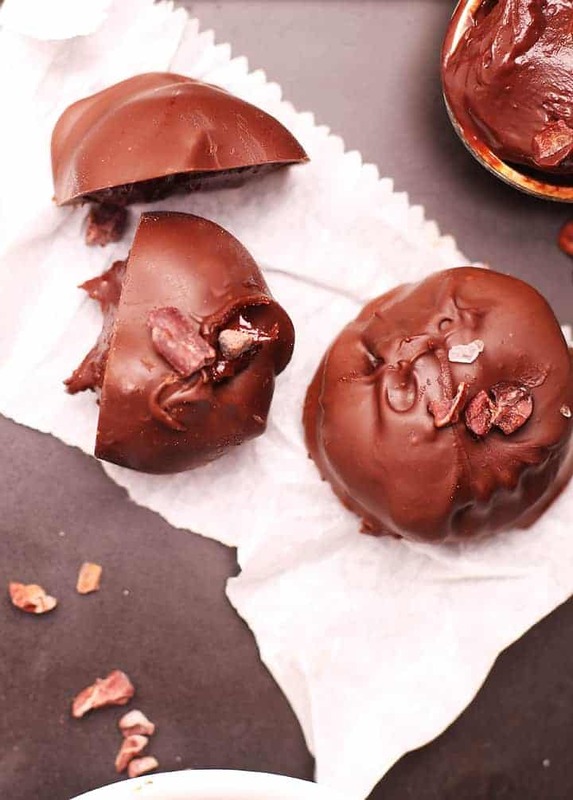 Rich and decadent chocolate ganache on the inside covered in a perfectly crisp chocolate coating and with a variety of flavor options, these vegan truffles make the perfect DIY Christmas gift or treat to serve at all your holiday gatherings. I’ve been making these Chocolate Truffles for years. Flavoring them in a variety of different ways – Orange, Peppermint, and Turkish Coffee being my go-to’s – I have found these are the perfect homemade gift for friends and family during the holiday season. They are decadent, delicious, and (surprisingly) pretty easy to make. Yay! Step One – Make the Chocolate Ganache. 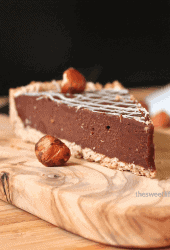 What is vegan chocolate ganache? I’m glad you asked! Classic chocolate ganache is a combination of chocolate and cream that can be used as a glaze, a filling for cakes and tarts, or rolled into chocolate truffles. The ratio of chocolate and cream depending on how you use the ganache. Since ganache is made of just two ingredients, cream (or in this case coconut milk) and chocolate, it is important to get quality chocolate. It should be high in cocoa percentage (at least 70%), bittersweet or semi-sweet, and should be made with few, high-quality ingredients. Your choice in chocolate will greatly impact the taste and texture of the ganache. 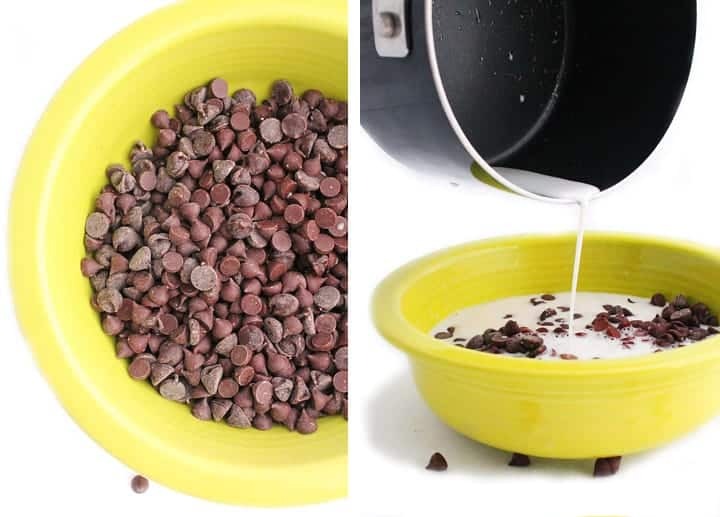 Place the chocolate chunks in a shallow bowl. In a small saucepan, gently heat coconut milk to a scald. Basically, you are looking for a thin skin to form on top of the milk. Bubbles will be starting below the surface, but you do not want it to get to the point that they are breaking through. This will burn the chocolate. Quickly removed the milk from the heat and pour evenly over the chocolate chips. With a rubber spatula, gently stir together the ganache in a folding motion, from top to bottom. This will take about 2-3 minutes. At first, it will look lumpy but keep up with the gentle folding. Eventually, it will come together. Once this happens the ganache will get dark brown and very smooth. Be careful not to over mix. The least amount of agitation to the chocolate, the better. Now we need to let the chocolate set. Once it’s evenly mixed, cover the ganache and let it sit for at least 6 hours (overnight is best) until the chocolate is thick and moldable. One the ganache is set, it’s time to shape the truffles. Using a small scoop, scoop out the truffles and place them on a parchment lined paper. Once all the ganache has been scooped into truffles, place the baking sheet in the freezer and let the truffles freeze for at least two hours. 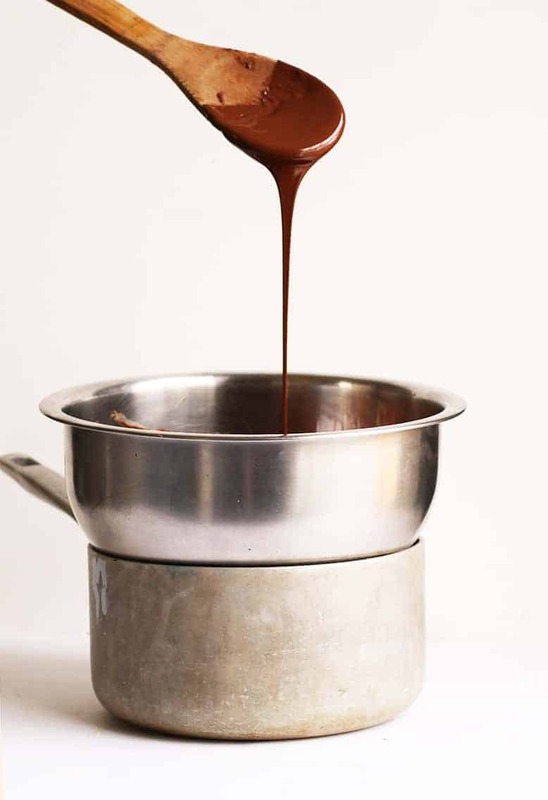 In a double boiler – which you can make with a sauce pot and a metal bowl (see picture above) gently heat the remaining chocolate with 1 tablespoon of coconut oil. Do not stir the chocolate more than necessary – this will agitate it. Just let the steam slowly melt the chocolate so that it is shiny and pourable. Check out this video for the perfect chocolate melting techniques. When the truffles are frozen and the chocolate is melted, insert a toothpick into the truffle and dip it completely in the melted chocolate. Let the excess chocolate drip off and transfer it back to a parchment-lined baking sheet. Repeat with all the truffles until they are all coated in chocolate. While the chocolate is still a little wet, top with desired toppings. Let the chocolate set completely before serving. Working with chocolate can be a bit challenging. Here are a few tips to make your truffle making easier. Don’t over-mix the chocolate at any point. Chocolate does not want to be messed with much. 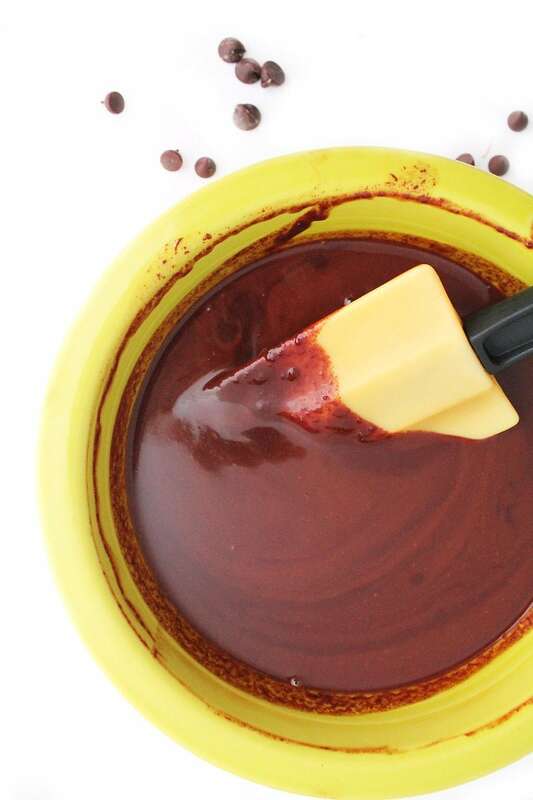 When mixing the ganache and chocolate, mix it only as much as necessary. Gentle heat will do most of the work itself. Don’t burn the chocolate. When melting the chocolate in the double boiler, make sure that the chocolate is only melting from the steam in the pot. Too much heat will burn the chocolate immediately. Make sure your truffles are completely frozen before dipping them. If they are not, they will start to fall apart in the chocolate making your chocolate cold and clumpy. Don’t refrigerate set chocolate. Once the truffles are dipped, the chocolate should set at room temperature. Refrigeration can cause condensation and the chocolate will become wet and lose its flavor. 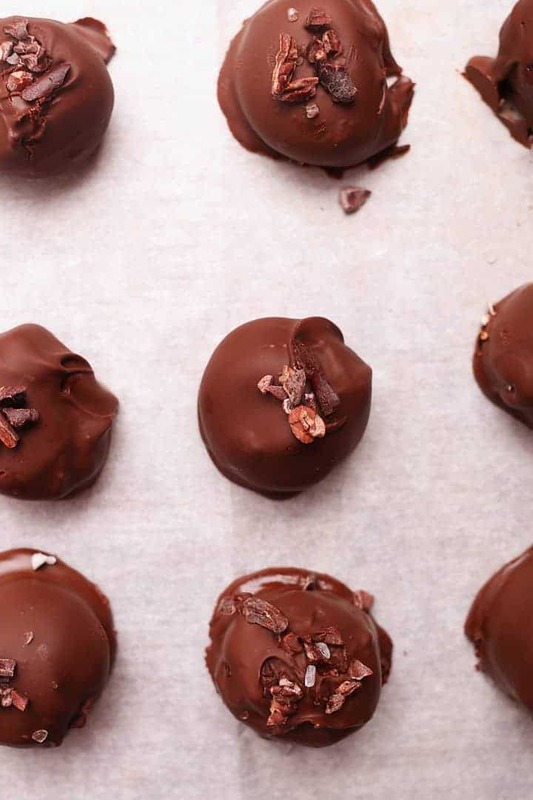 Vegan truffles are a wonderful homemade holiday gift. I love to grab a handful of these gift boxes and give them to my friends and family during the holiday season. Truffles are also a nice treat to bring out during holiday gatherings. Whether it’s decorating the Christmas treat or having a holiday cocktail party, a plate of truffles and cookies are always a welcome tradition. 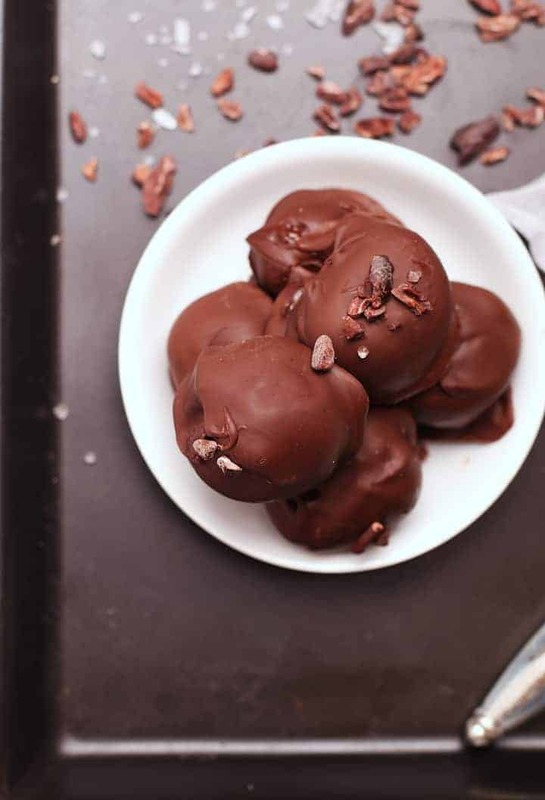 Ready to get started on making a batch of these 3-ingredient vegan chocolate truffles? Let’s check out the recipe below. First, make the chocolate ganache. 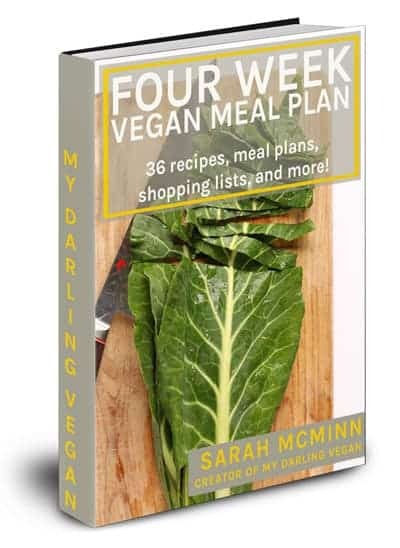 Place 12 ounces of vegan chocolate chips in a medium bowl and set aside. In a small saucepan heat the coconut milk to a scald (just before boiling point). A skin will form over the top and the sides will begin to simmer. Remove hot cream and pour immediately over the chocolate chips. Cover for 3 minutes. Remove lid and stir together with a spatula until the chocolate and cream come together to create a homogeneous thick sauce. Do not over mix! Cover and allow ganache to set up at least six hours or overnight. When the ganache is hard, roll mounded teaspoon size balls and place on a baking sheet lined with parchment paper or a silicone baking mat. Freeze for at least 2 hours. In a double boiler, gently melt the chocolate and coconut oil until smooth. 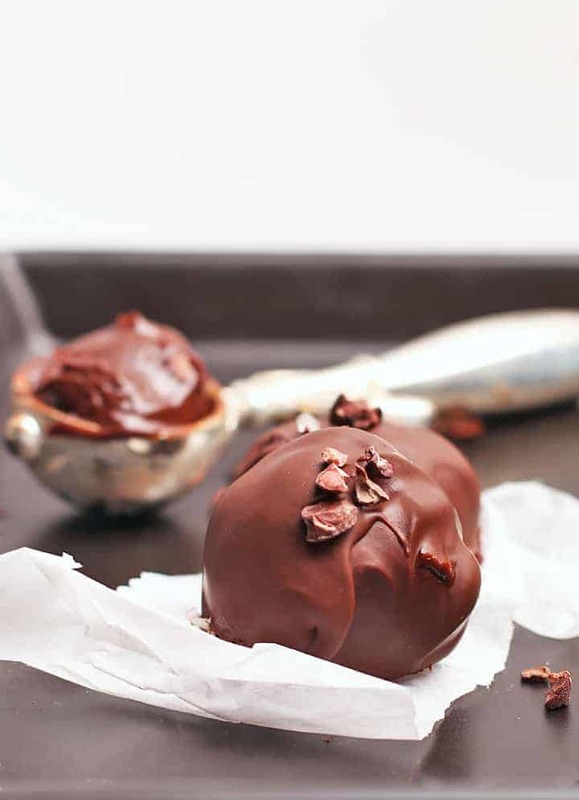 Insert a toothpick into a frozen truffle and dip into the chocolate. Allow excess chocolate to drip off before placing truffle back on parchment-covered baking sheet to harden. Repeat until all the truffles are dipped. Let cool at room temperature until the outside chocolate is completely set. Store in an airtight container at room temperature for up to 7 days. Chocolate Orange: 1 tsp. orange extract. Top finished truffles with a pinch of orange zest. Chocolate Peppermint: 1/2 tsp peppermint extract. Turkish Coffee: 1 tbsp instant coffee or finely ground regular coffee + 1/4 tsp cardamom. Top each truffle with a coffee bean. These came out perfectly and delicious! Thank you so much for this easy and tasty treat. I made them for Valentine’s Day and covered some in dark chocolate and some in white chocolate (all vegan) and covered in chocolate sprinkles. Thanks again!! I’m glad they worked out for you! This is a great gift idea! Would you say it’d work equally as well if I put the ganache in little heart shaped molds for Valentine’s Day? For sure! I’ve done that before and loved the way they’ve turned out. Can the coconut milk be substituted by almond and if so, is it the same measure? Thanks! 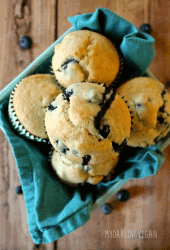 This recipe looks delish, just no coconut milk in the house! I use coconut milk from a can so it’s much richer than almond milk. You could swap it out but the truffles will be less rich and dense. I would recommend an unsweetened non-dairy creamer instead. Do you use coconut milk from a carton or a can? Canned coconut milk. Make sure to get full fat rather than light. These look so delicious! Thanks for all of the awesome recipes. Although my eating habits have definitely diversified since I’ve started eating a vegan diet, there are two desserts that I’ve been unable to enjoy as a vegan: tiramisu (how to mimic the mascarpone cream?) and highland shortbread (rounds edged with coarse sugar). The latter hold a special place in my heart due to childhood memories of enjoying them with the Scottish side of my family. I’ve tried to replicate ‘Highlanders’ with Earth Balance but they ended up tasting really ‘off’, for lack of a better explanation. Any suggestions on how to veganize these desserts would be greatly appreciated! I’m working on a tiramisu recipe right now so once I’ve figured it out, I’ll let you know. All I know is the mascarpone cream needs to be made out of cashews for equal creaminess and richness. As for the shortbread cookies, I know what you’re talking about, but have never had one. I don’t actually know what would be better than earth balance in terms of getting the right taste. 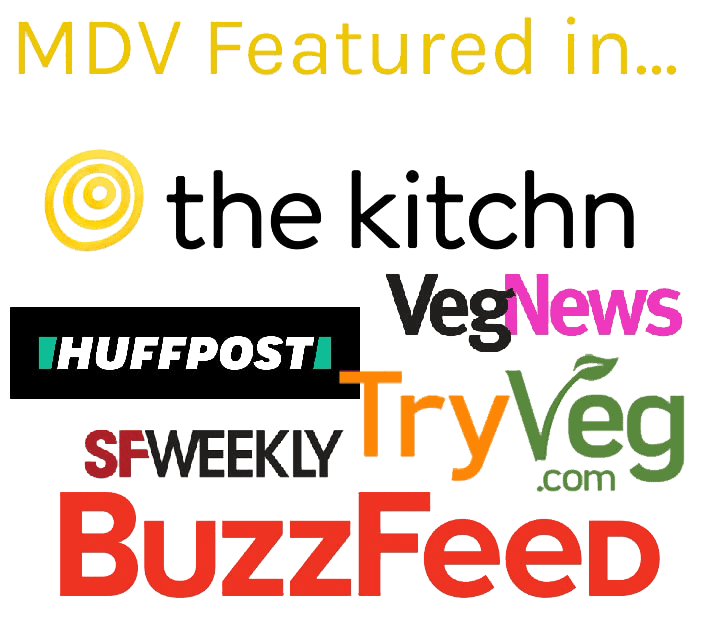 You could try making your own vegan butter, you’ll find recipes for that if you google it. Perhaps the flavor of those butters will improve the overall cookie. I’m sorry I can’t be more helpful! These are so easy, and so good!! Great recipe. Hi, I’m in the middle of making these and was wondering what you mean by letting the ganache set up for at least 6 hours? 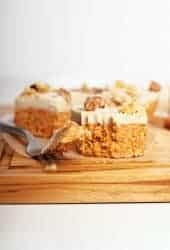 Do you leave it out at room temperature or in the fridge? Thanks! Let the ganache set up at room temperature. The time it takes will vary because of a number of factors but you want to wait until it’s easily moldable by hand to roll into balls, which will be at least 6 hours. Good Luck! I’m a sucker for chocolate – especially chocolate covered chocolate! Truffles are the most elegant, yet simplest dessert I can think of. I do believe I’ll have to whip some up for the upcoming holidays! The chocolate-orange combination is always a winner in my book. 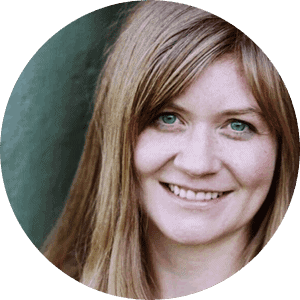 What a great post-I’m going to have to remember these ideas for next time! I usaluly do a lot of baking for friends and family around the holidays. I’ve actually spent most of today in the kitchen making several batches of fudge and chocolate chip pumpkin loaves. They both make perfect gifts! Thanks Marcela. I love Christmas baking and I agree, the treats of often my favorite gifts to give. These look amazing! The one food I wish I could duplicate better is feta cheese. I’ve done some tofu marinated in lemony, Greek dressing and it’s good, but not the same. Any ideas? I haven’t had good luck with feta cheese either. I too wish I had better luck with it, but sadly, no. If you ever figure it out, let me know!